High-protein diets are trendy, but how much protein do you really need? Joey Thurman, a Chicago-based trainer, shares his picks for protein sources. High-protein diets are all the rage. Look on grocery shelves and you will probably find protein bars, protein powder or other foods with labels proclaiming it is "high-protein." But what exactly does protein do for your body and how much of it do you really need? Joey Thurman, a Chicago-based celebrity trainer and certified fitness nutrition specialist, is here with everything you need to know about protein. What is protein's role in the body? You need protein for just about every function in your body, from brain cell communications to building and repairing muscle. Protein is key in our bodies by providing structure and strength to our cells and tissues, controlling biochemical reactions to helping our immune systems. Our metabolism is regulated by proteins as well as hormones and the many things they control. Proteins also help cell division which will help with replenishing aged or damaged cells to provide a constant supply of healthy cells. Protein needs vary based on activity level and gender. In general, men weigh more than women and require more calories to maintain weight, so basic protein requirements for men are higher. But everyone is different and you can calculate your own needs based on your weight and activity level. The Recommended Dietary Allowance, or RDA, which describes the minimum amount of a nutrient recommended for health, for protein is .36 grams per day, per pound of body weight. (STOCK PHOTO/Getty Images) Protein-rich foods are displayed on a counter. So if you weigh 150 pounds and work in a desk job, which is considered sedentary, that’s about 54 grams of protein per day. That translates to 216 calories, or 10 percent of a 2,000-calorie daily diet. To calculate how many grams of protein you need each day, just multiply your weight in pounds by .36. Women who are pregnant or nursing and people with kidney or liver disease may have different protein needs and should, as always, consult with their doctors. Do I need more protein as I get older? Protein requirements don’t change much based on your age, but there is increasing evidence that we may need more protein as we get older to prevent muscle and bone loss, accompanied by a weight-bearing exercise program. A 2015 study published in the American Journal of Clinical Nutrition showed evidence that adults over 50 should aim for about double the RDA amount, so around .68 grams of protein per pound. If you are more active, these requirements will need to be higher as your body will need to build and repair your muscle tissue to make up for the stress of activity to your body. If you are very active and get at least 35 to 40 minutes of exercise four to five days a week, including resistance training twice a week, you should bump up your protein intake to .5 to .9 grams per pound of body weight per day. Shandra and Gerald Redwin have fun on vacation while staying healthy. ABC News' Dr. Jennifer Ashton shares the biggest takeaways from the new study. Mycoplasma genitalium was first discovered in the early 1980s. There are exceptions to this rule, like professional athletes and bodybuilders, who will need to go higher than these levels to upwards of two grams of protein per pound, but use these as a general guideline. Now that you have figured out how much protein you need, where should you get it from? Protein can come from many sources and you should try to choose several sources to get a variety of nutrients. A common misconception is that people need to only eat animal products to get protein. There is protein in all sorts of plants, even things that are green. In fact, you tend to get a high protein/calorie ratio in plant-based proteins over meat equivalents. Yet another reason to try a Meatless Monday, or even add more days with alternatives to meat proteins. It is important to eat healthy protein-rich foods, including fish. A six-ounce serving of wild salmon has 34 grams of protein and only 1.7 grams of saturated fat. 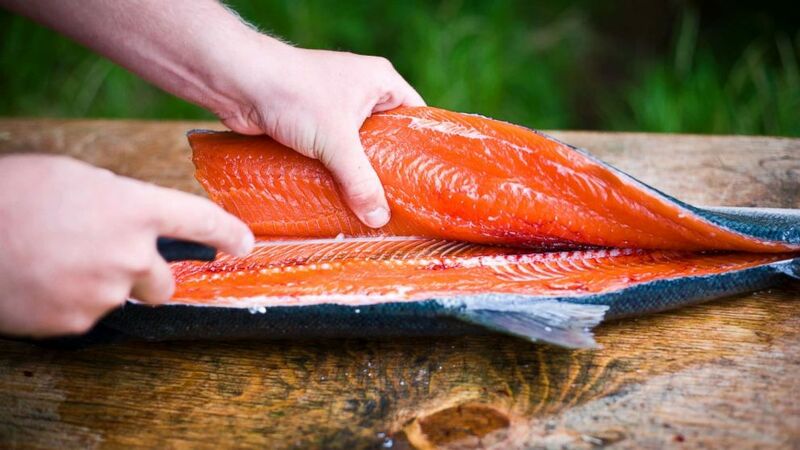 (STOCK PHOTO/Getty Images) A person fillets a freshly caught wild salmon in an undated stock photo. 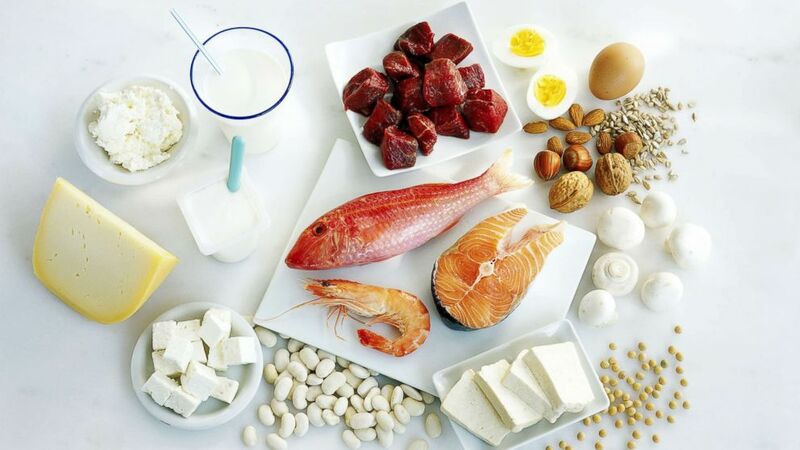 Other good sources of protein are lean meat, poultry, eggs, beans, peas, soy products and unsalted nuts and seeds. Steer clear of protein sources with unhealthy fats, like processed red meat, cold cuts and hot dogs. Your protein sources should come from whole food first and supplements second. Remember, supplements are meant to add to your diet, not replace foods. 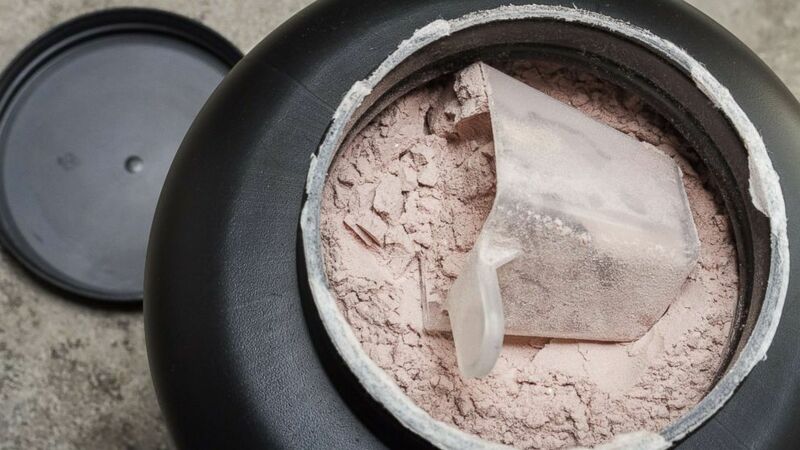 The two main type of protein powder are whey protein powder, which is made from milk, and plant-based protein powders, which are made from pea protein, brown rice, flax or other sources. The average serving size of protein powder has around 20 to 25 grams of protein. (Shutterstock) A scoop of fine whey protein powder sits in a container in an undated stock photo. Whey protein can be absorbed fast in your body and is a great source of protein to grab before or after a workout and on the run. Plant-based proteins are beneficial because they are often packed full of vegetables. But, beware of sugar and other additives which can be loaded into protein shakes. Fist-size portion of broccoli -- 3 grams protein. A thumb-size portion of peanut butter -- 3 grams protein. A baked potato -- 4 grams protein. One avocado -- 4 grams protein. One cup of quinoa -- 5 grams protein. 1 bunch of asparagus -- 15 grams protein. 1 egg -- 7 grams protein. 3 oz, palm-size chicken breast -- 25 grams protein. 1/2 cup of kidney beans -- 7.5 grams protein. 6 oz Greek yogurt -- 17 grams protein. Of course, any big changes in your own diet are worth a mention to your own doctor, who knows your medical history.